AWARDS Ceremony – Wed. 1 June. WEDNESDAY 1 June 2011, 18-20.00 at METAL at Edge Hill Station. The Liverpool Art Prize Awards. The overall winner and people’s choice winner will be announced at 18.30. Special guest: Mike Stubbs, CEO at FACT will give a speech. The People’s choice award winner will also be announced. This is decided by votes from visitors to the exhibition. The exhibition runs until 11 June. Open Tue – Fri 2 – 6pm Sat 12 – 4pm. Free. 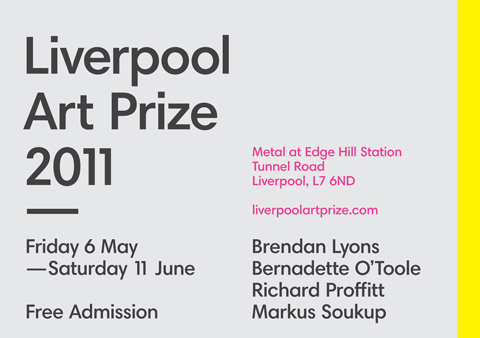 For more information see www.liverpoolartprize.com or contact edgehill@metalculture.com or 0151 7072277. Sponsors: Artinliverpool.com, METAL, ABW Architects, Duncan Sheard Glass, Arthur Diamond Design, The Gallery Liverpool, National Museums Liverpool, Ultimate Holding Company, Bill Elms Associates, McCoy Wynne Photography, Barefoot Wines.